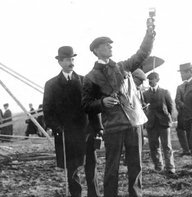 1909 Winter and Spring — Wilbur Wright flies for audiences in Europe, launching his Wright Model A airplane from locations in France and Italy. He is accompanied by Orville and Katharine. 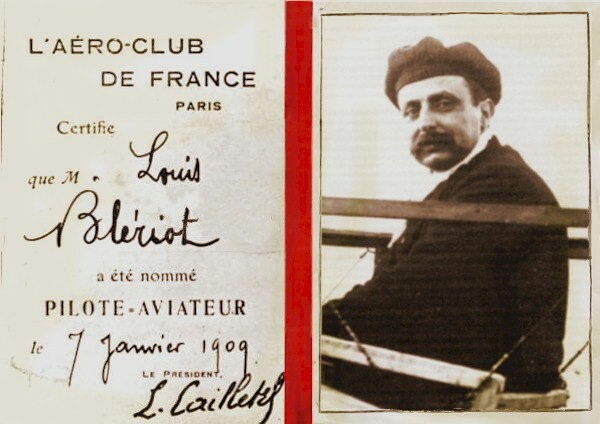 January 7 — The Aéro-Club de France issues the first 15 pilot licenses, the first going to Louis Blériot. Number 15 is awarded to Wilbur Wright. 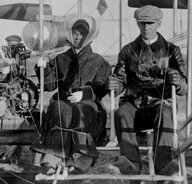 January 11 A recuperating Orville Wright and his sister Katharine join Wilbur in Plymouth, England. They are also met by Hart O. Berg, his wife Edith, and members of the Aéro-Club de France. January 23 — Louis Blériot flies the Blériot XI, his first truly practical monoplane, for 200 meters (656 feet). It features the stick-and-rudder control system first introduced on the Blériot VIII. The eventual success of this aircraft will make its controls standard in future airplane designs. February 10 — The Smithsonian awards the Wright brothers (in absentia) the Samuel P. Langley Gold Medal for Aerodromics, but it is not presented until they visit Washington, D.C. later in the year. 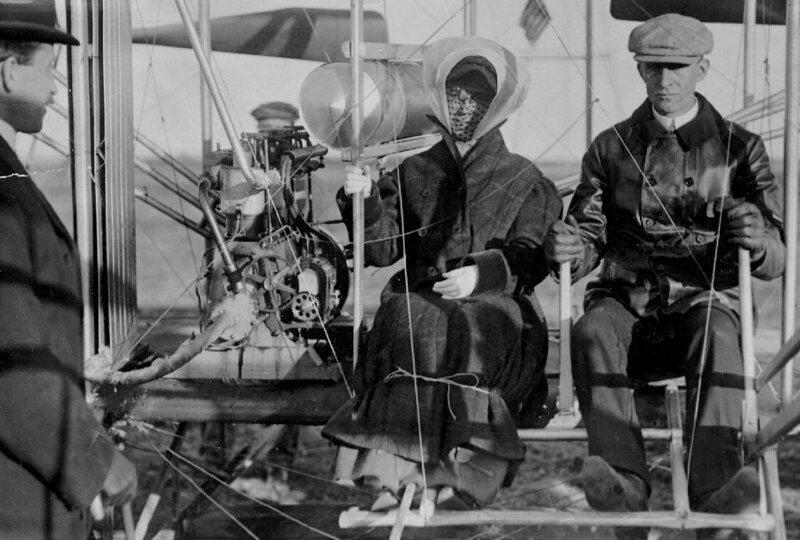 February 15 — Katharine Wright flies with her brother Wilbur for the first time. February 27 — La Compagnie Générale de Navigation Aérienne produce their first Wright Model A. It is intended to be used to instruct student pilots. March  The Wrights sign a contract with the Short Brothers of England to produce six Wright Model As. 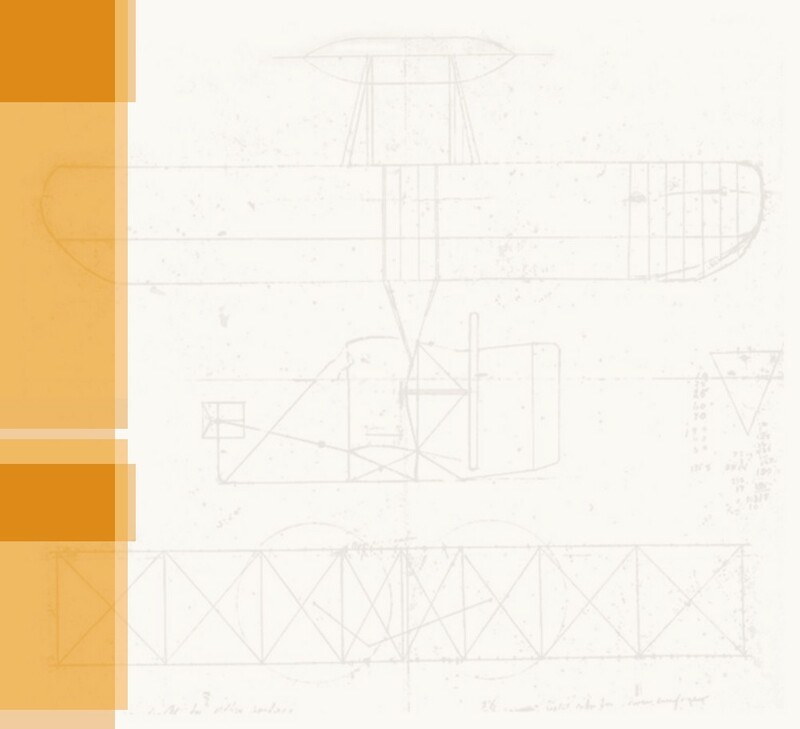 Eustace Short makes the first complete set of engineering drawings for the aircraft. March 10 — James McCurdy, Canada, of the Aerial Experiment Association flies the Silver Dart in a complete circle. 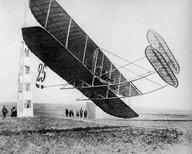 It is the second truly practical airplane to fly in North America following the 1905 Wright Flyer. 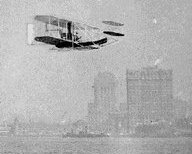 March 20 — Glenn Curtiss and Augustus Herring incorporate the Herring-Curtiss Company to manufacture airplanes. 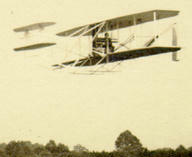 Herring has led Curtiss to believe he has patents for an airplane that he declined to deliver to the US military in 1908, and that these will countermand the 1906 Wright patent. March 21  Wright student Count Charles de Lambert and Paul Tissandier fly 25 kilometers (16 miles) to qualify for their pilot licenses. April-May  In France, Henry Farman develops a biplane, the Farman III, that uses ailerons to control roll. It is the first practical European airplane with ailerons. April 16  Wilbur Wright begins to train Italian student pilots Lt. Umberto Savoia and Lt. Mario Calderara. 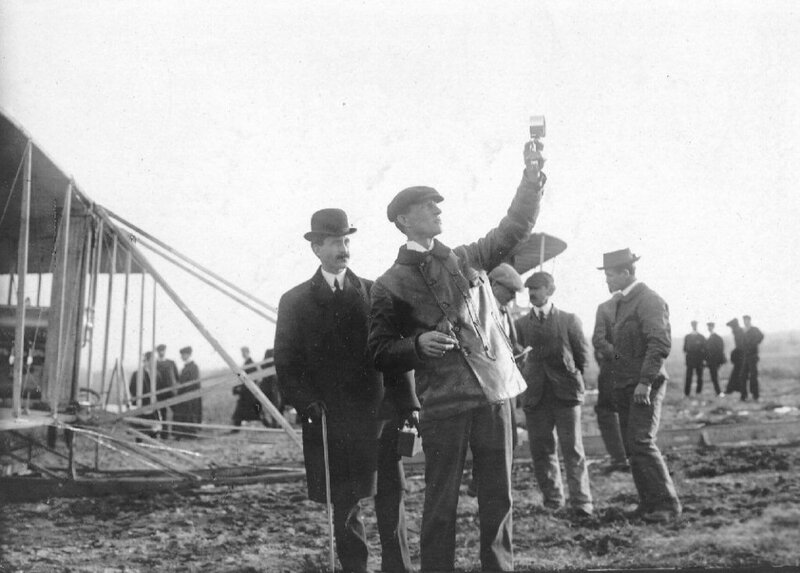 April 24  Wilbur Wright flies with a Universal News cameraman. making the first motion pictures to be shot from an airplane in flight. 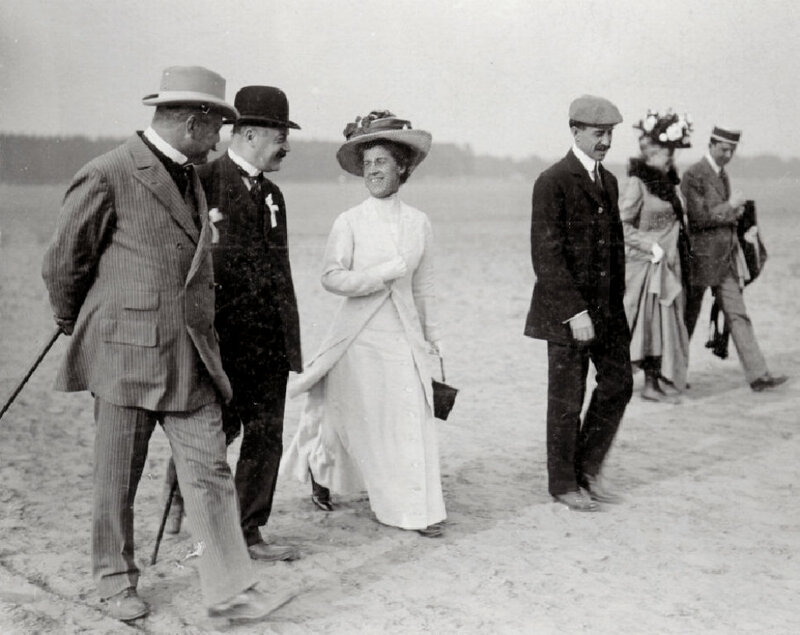 April 28-May 13  Wilbur, Orville, and Katharine Wright travel from Rome to Paris to London, to New York City and finally arrive home in Dayton, Ohio. May 23  Port-Aviation, the world's first airport, opens 19 kilometers (12 miles) from Paris, France. 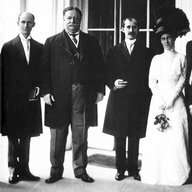 June 10  The Wright Brothers visit Washington, D.C. where President Howard Taft presents each of them with the Congressional Medal of Honor, Aero Club of America Medal, and the Samuel P. Langley Gold Medal for Aerodromics. 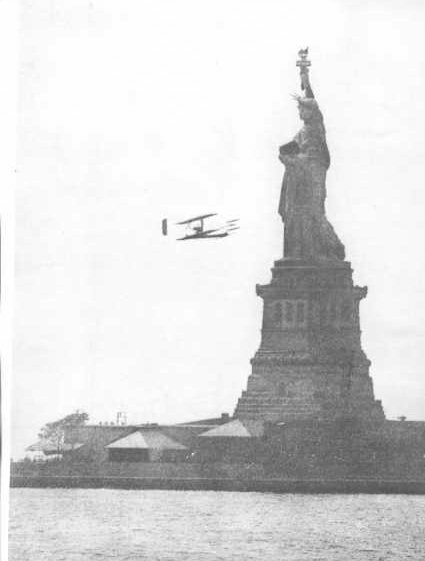 June 16  Glenn Curtiss delivers the Golden Flier to the Aeronautic Society of New York. 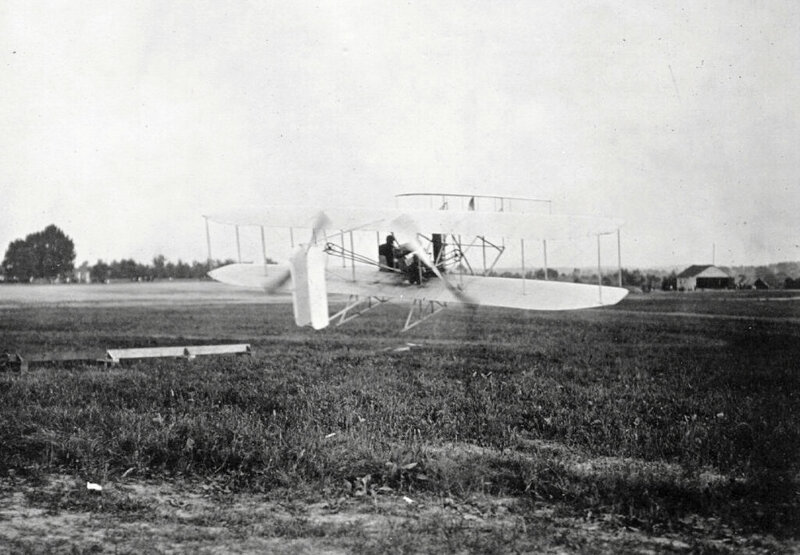 It is the first commercially-sold airplane in America. 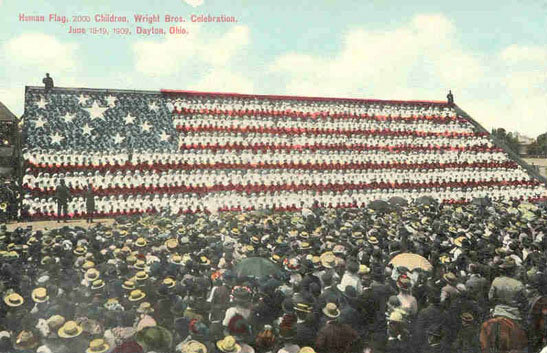 June 17-18  The Wrights return home to Dayton and a heroes welcome. 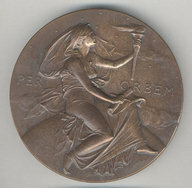 The two-day homecoming celebration includes a parade, speeches, the presentation of more medals, and a reception at the YMCA where Wilbur and Orville stand for hours to shake the hands of thousands of well-wishers. 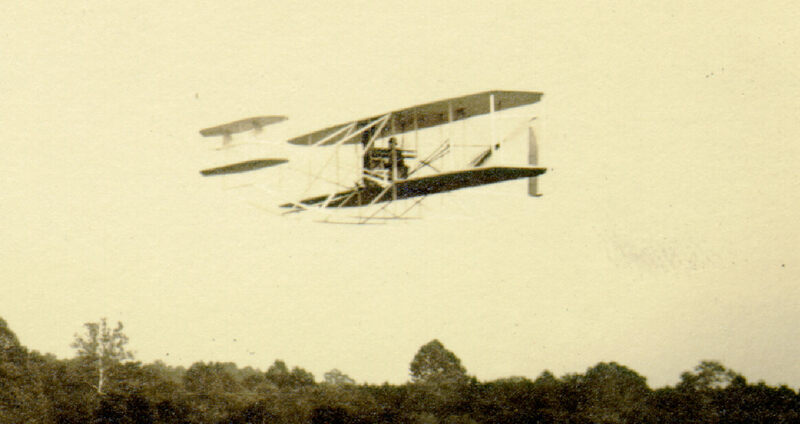 June 29-July 30 — The Wrights deliver their new Military Flyer to the U.S. Army Signal Corps at Fort Myer, Virginia, and put it through the required trials. 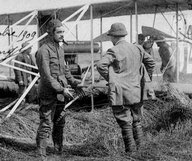 The Army accepts the flying machine and Signal Corps No. 1 becomes the first military aircraft in the world. Later, the aircraft is christened the Miss Columbia, but the name does not stick. Her pilots refer to her as "Old Number 1." July 2 — Anticipating commercial air traffic by many years, the Aéro-Club de France proposes of air routes similar to shipping lanes. This idea will grow to become the Vector Airway System ("V" routes) used today. 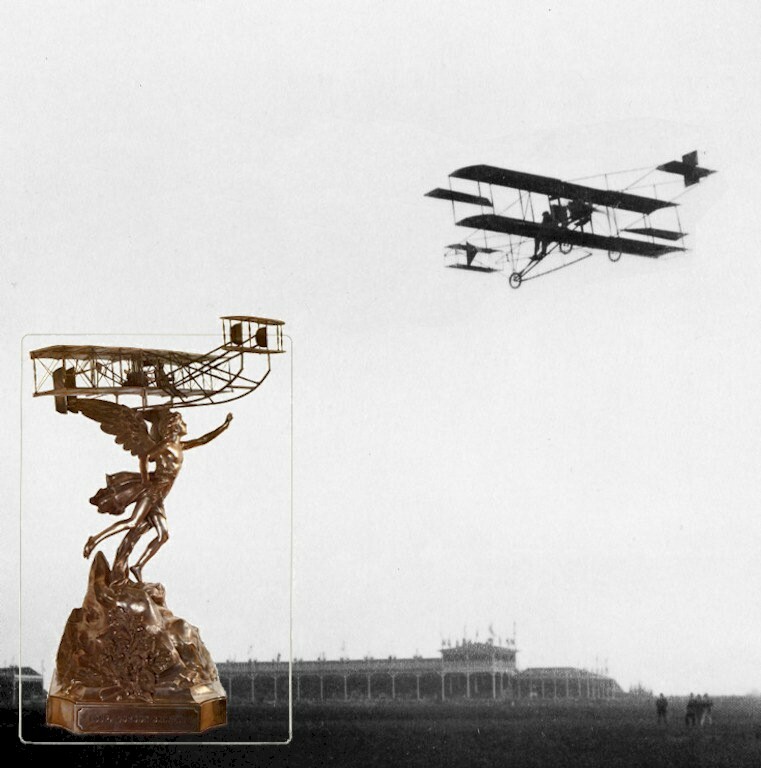 July 17 — Glenn Curtiss flies 25 miles in the Golden Flier to win the Scientific American Trophy for a second year in a row. July 23 — Alliot Verdon Roe, England, flies his Avroplane for 274 meters (899 feet). 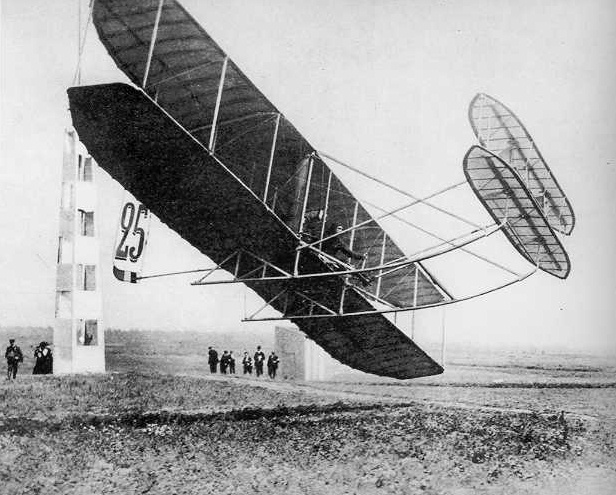 It is the first aircraft designed, built, and flown by a British citizen. July 25 — Louis Blériot crosses the English Channel in a Blériot XI monoplane. This has an enormous psychological effect around the world because it shows that natural physical boundaries that had protected nations for millennia can be crossed easily by an airplane. August — The Wright Brothers file law suits against Glenn Curtiss and the Herring-Curtiss Company. Judge John R. Hazel of the United States District Court for the Western District of New York is assigned to the case. The Wrights accuse Curtiss of using the same combination of aerodynamic controls as claimed in their 1906 patent. These are the first shots in what will become known as the "Patent Wars." August 22-29 — 22 pilots from all over the world converge on the old French cathedral city of Reims for the first-ever aviation meet. 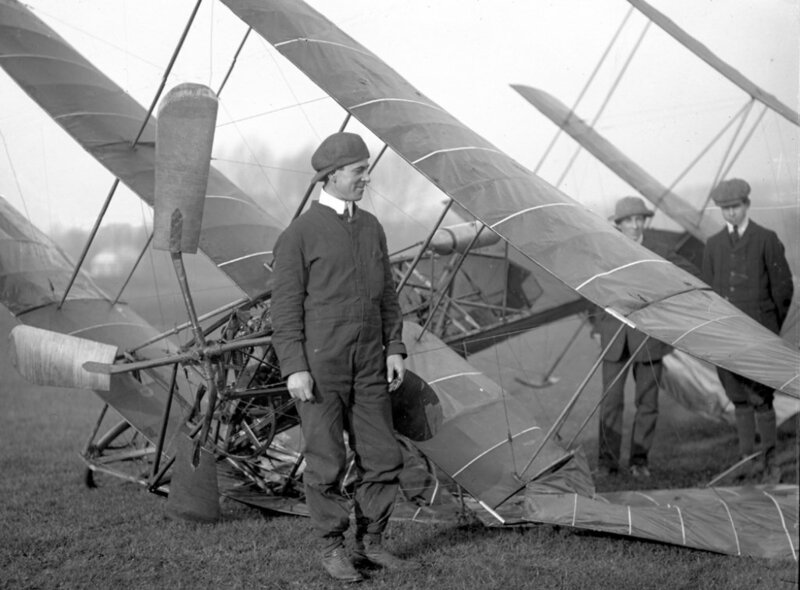 There are hundreds of flights over seven days, and one spectator, David Lloyd George (who would later become Prime Minister of England), remarks, "Flying machines are no longer toys and dreams; they are an established fact." 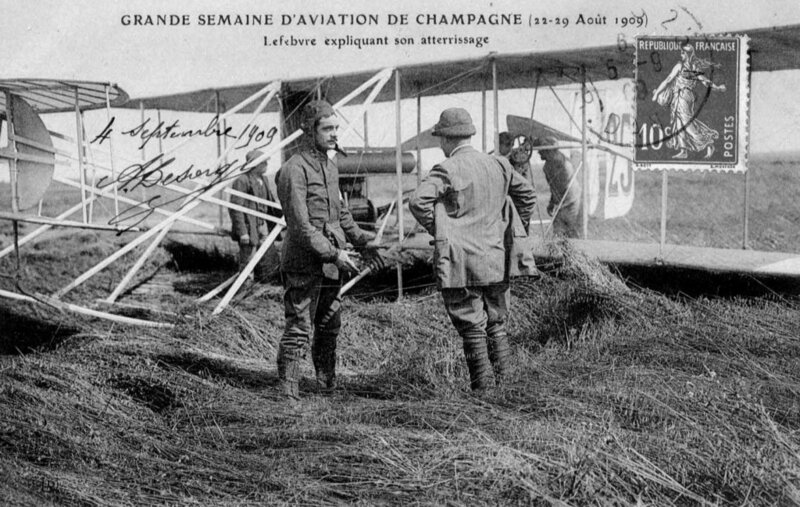 August 27 — Henry Farman, France makes the first flight of over 100 miles and wins the contest for endurance flying at Rheims. August 29 — Curtiss comes in first in the speed contest at Reims, capturing the Gordon Bennett Cup and setting a new world's speed record of 46.5 miles per hour (75.6 kilometers per hour). September 7 — Eugene Lefebvre dies while testing a new French-built Wright airplane. He is the first pilot to die at the controls of his craft. 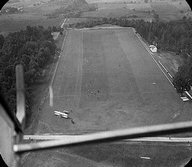 That same day, the US Army Signal Corps establishes its first airfield at College Park, Maryland. 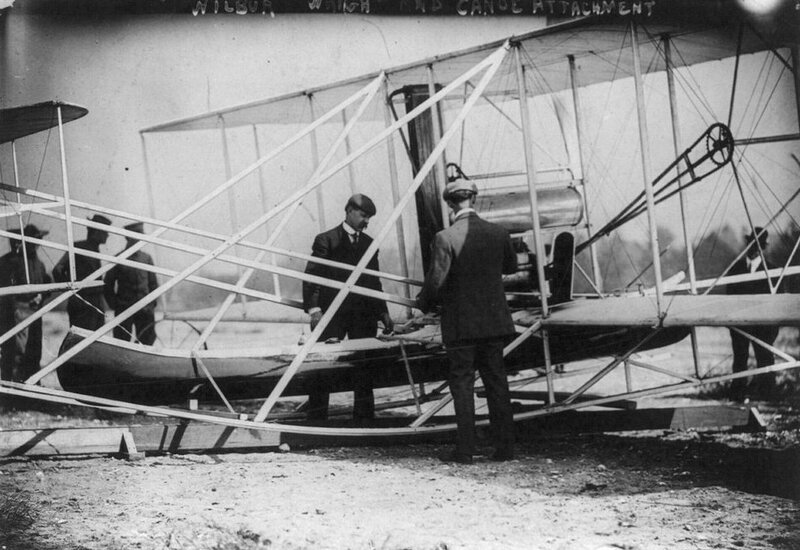 October 2 — Orville Wright makes the first fight above 1000 feet (305 meters) in altitude. September 25-October 1 — Over 100,000 people visit the Exposition Internationale de Locomotion Aérienne in the Grand Palais, Paris, France. Dozens of aircraft and hundreds of aviation engines and inventions are displayed. 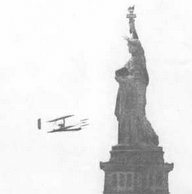 September 30-October 4 — For the Hudson-Fulton Celebration in New York City, Wilbur Wright circles the Statue of Liberty and flies up the Hudson River to Grant's Tomb and back. Over a million people see him fly. October 8-November 2 — Wilbur Wright trains the first US Army pilots, Lt. Fredric Humphreys, Lt. Frank Lahm, and Lt. Benjamin Foulois at College Park, Maryland. Although Orv joined his brother in Europe, Will continued to do all the flying while Orv was on the mend. 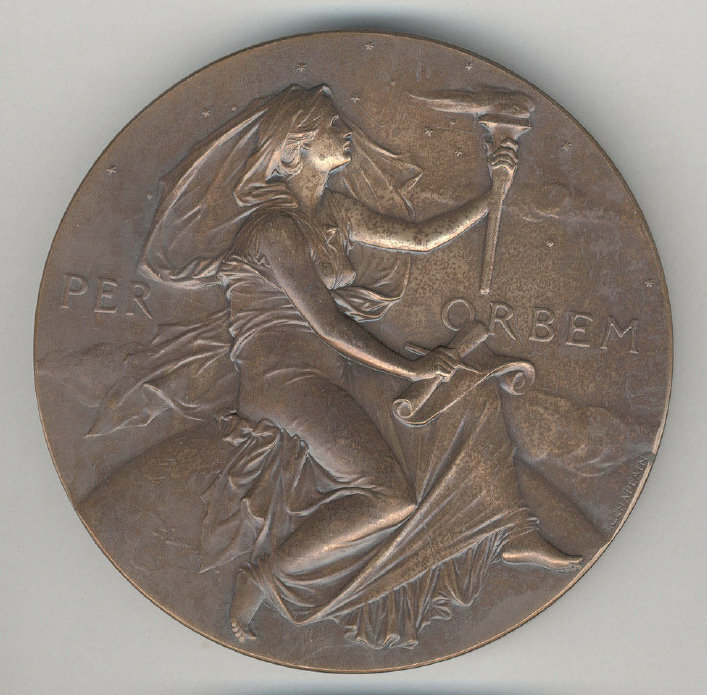 There have been 68 recipients of the Langley Medal since the Wright brothers. 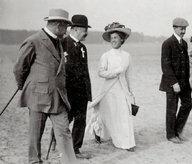 Katharine entertains royalty at the flying field in Pau, France. She served as the social director for her shy brothers. 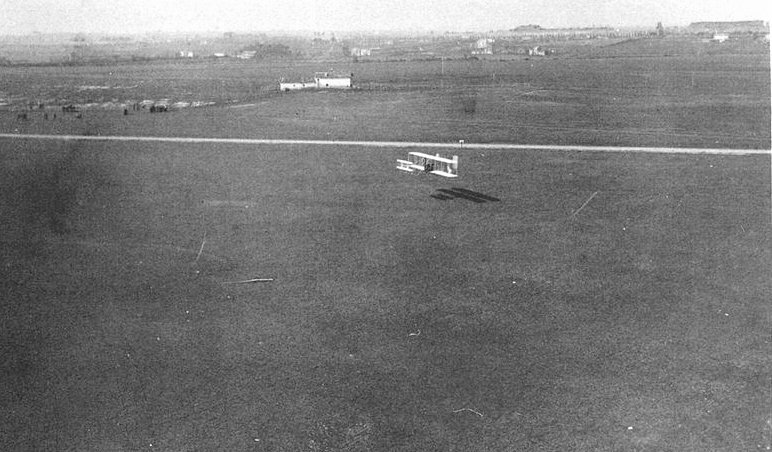 A French-built Wright Flyer rounding a pylon at an air meet. 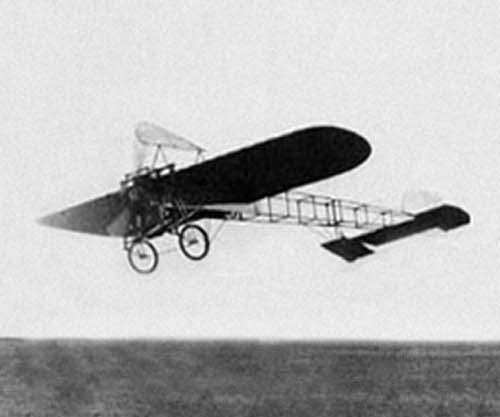 The Farman III had single-acting ailerons – only one moved at a time. Additionally, the control wires only moved them in one direction – up. Gravity brought them down. A photographer also shot the Wright Flyer in flight from a balloon at Centocelle. This was the first time an aircraft had been photographed from the air. 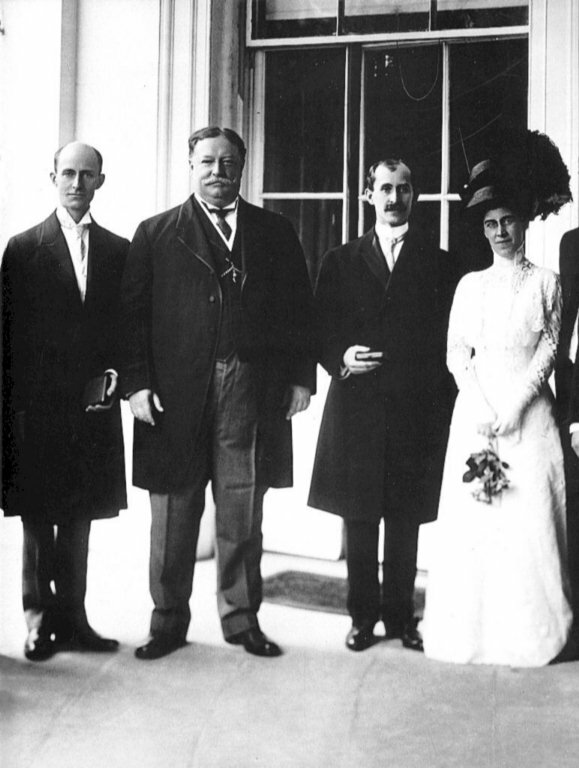 President Howard Taft is flanked by Wilbur, Orville, and Katharine Wright just after presenting the Langley Medal to the brothers. 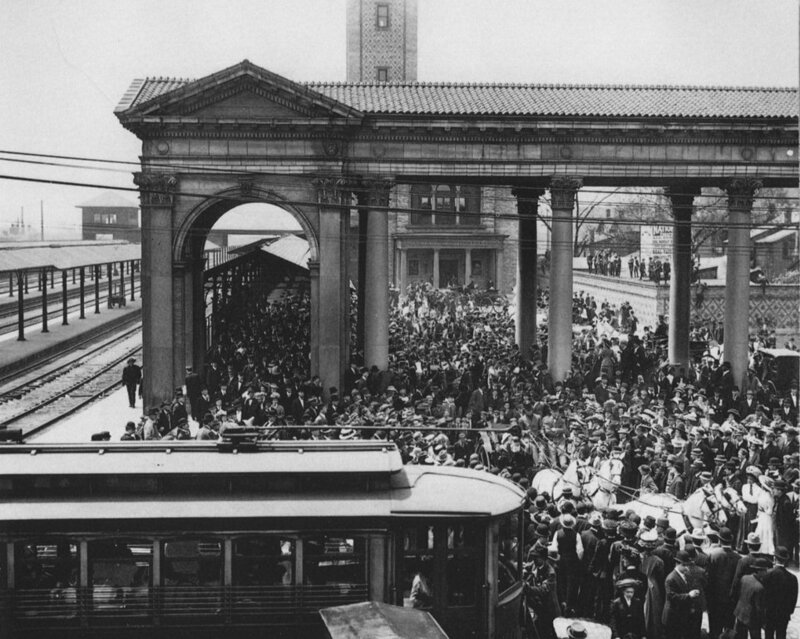 A carriage pulled by four white horses carries Wilbur and Orville away from the train station through cheering crowds when they return home to Dayton, OH. The Wright Military Flyer was a one-of-a-kind aircraft, similar to a Wright Model A but with less drag and more thrust. 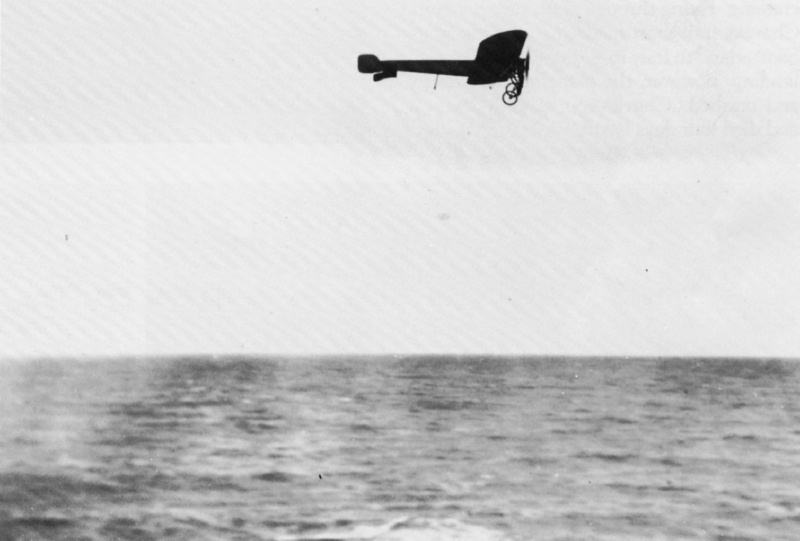 Bleriot crossed the English Channel at an altitude of about 250 feet (76 meters), traveling 22 miles (36 kilometers) in 37 minutes. It was not highest, furthest, or fastest flight to date, but it was the most politically significant. 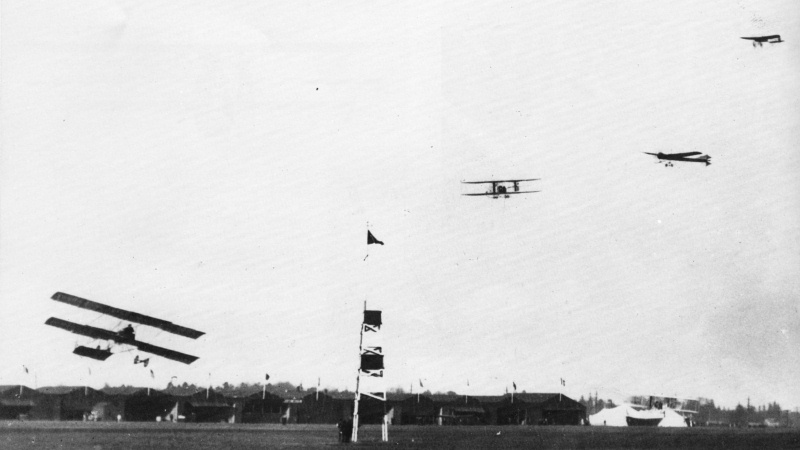 At the Reims Meet, there were often several airplanes in the air at once, an unheard-of spectacle in 1909. Eugene Lefebvre with a French-built Wright Flyer at the Reims Air Meet. Lefebvre was the chief pilot for La Compagnie Générale de Navigation Aérienne. 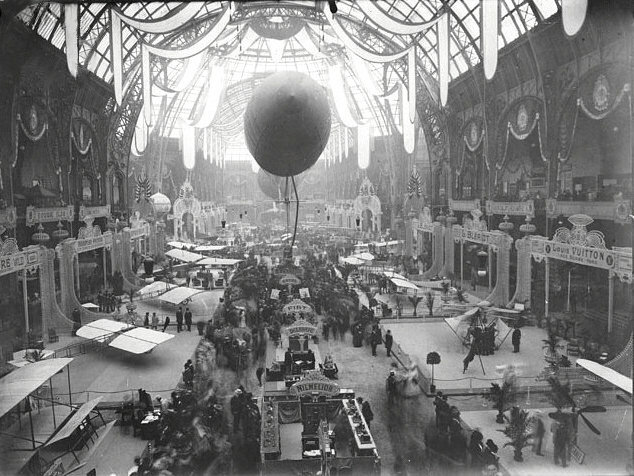 Although there had been displays of aviation hardware since 1868, the 1909 Exposition Internationale de Locomotion Aérienne was the first in which many of the aircraft on display had actually flown. 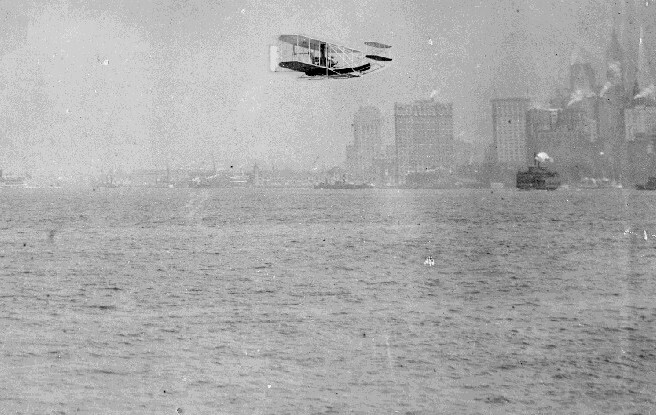 Wilbur flies by the New York City skyline on his way to Grant's Tomb. Lt. Fredrick Humphreys became the first U.S. military pilot to solo on 26 October 1909. Louis Blériot was the recipient of the first official pilot's license. 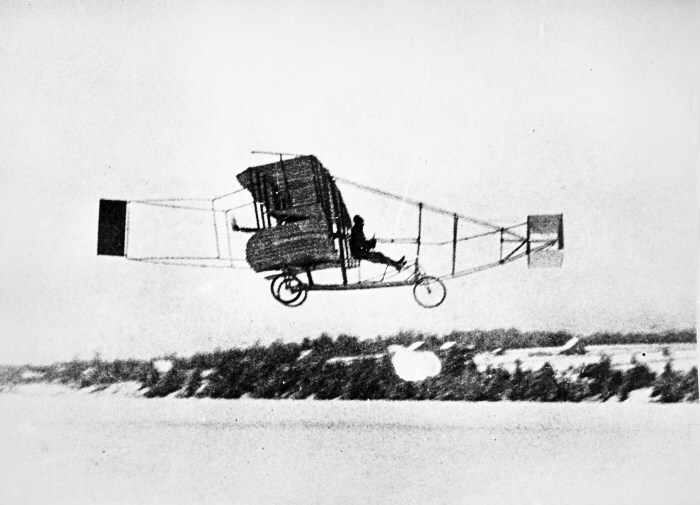 The Blériot XI during an early flight. Blériot soon discarded the vertical fin over the engine and cockpit. Katharine Wright with skirts tied to her ankles ready to fly with her brother Will. 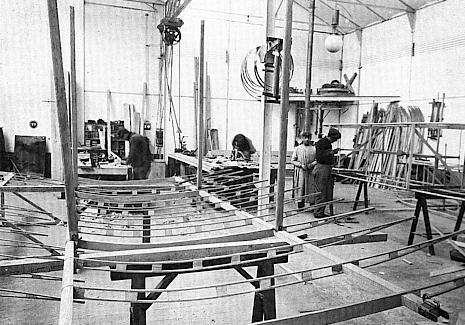 French workmen construct the top wing of a Wright Flyer at La Compagnie Générale de Navigation Aérienne. The AEA's Silver Dart was designed to carry two people seated in tandem, but there is no record that it ever did. 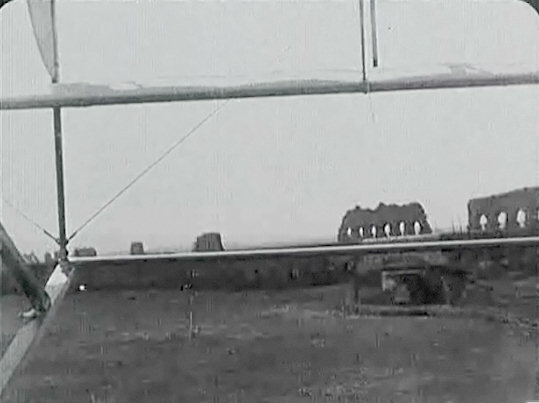 A frame from the film shot aboard the Wright Flyer in Centocelle, Italy. The camera is pointed under the forward elevator at the ruins of Roman aqueducts. 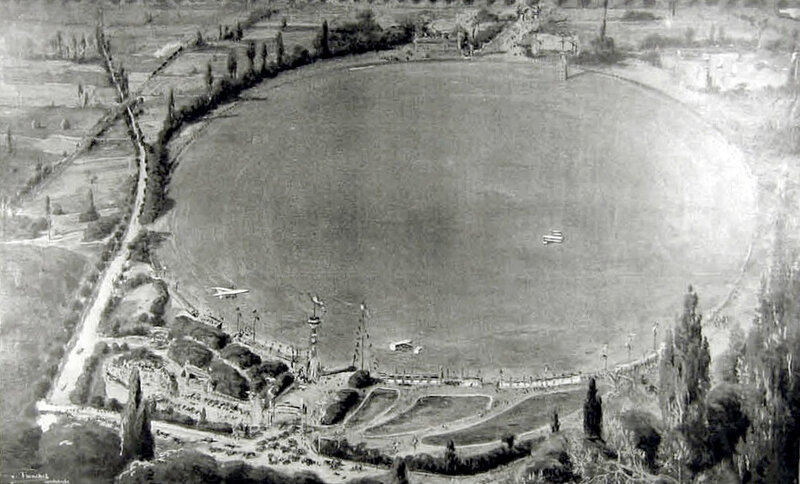 Port-Aviation at Juvisy, France was a circular field 3 kilometers (1.8 miles) across so aircraft could always land into the wind. 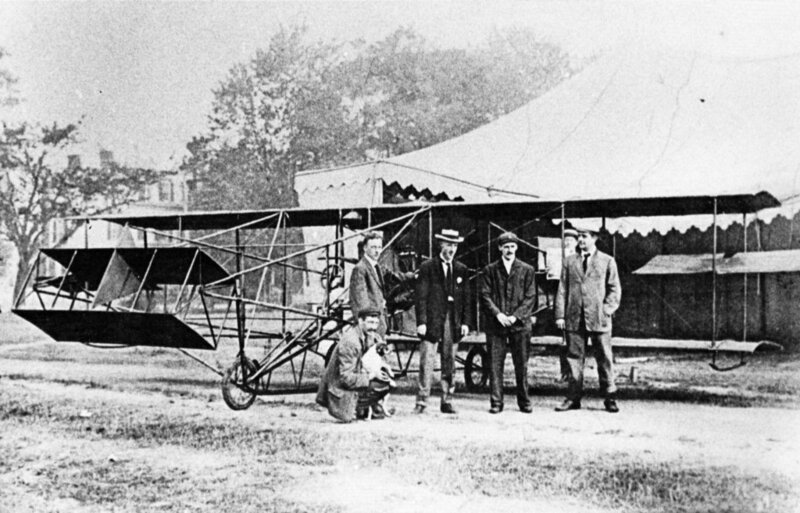 The Golden Flier was the prototype of the popular Curtiss Model D. In this photo, Curtiss is second from the right. This human flag, made up of over 2000 children, was part of the homecoming celebration. 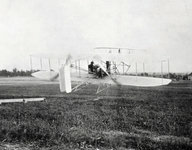 Between July and December of 1909, A. V. Roe made several short flights in his triplane before it was wrecked beyond repair. 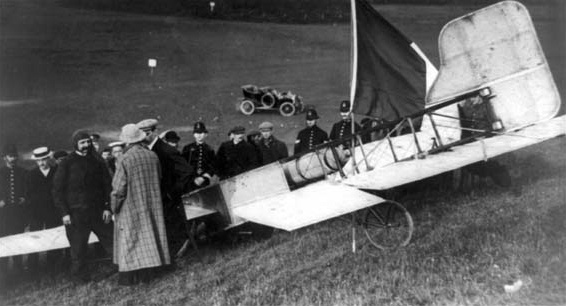 Bleriot flew from Calais, France to Dover, England where high winds forced him to make a hard landing. His landing gear collapsed, but Bleriot was unhurt. Louis Blériot was favored to win the 1909 Gordon Bennett Cup with his Blériot XI, but Curtiss and his Reims Flier beat him by just 5.8 seconds. An aerial view of the newly-established flying field at College Park, Maryland, taken from a Wright airplane. Wilbur Wright and Charley Taylor attach a canoe to keep the Flyer afloat should it go down in the Hudson River. Wilbur buzzes the Statue of Liberty.